A couple decades ago, the former Commissioner of the Federal Bureau of Narcotics, Harry Jacob Anslinger described marijuana as the most dangerous narcotic substance in the history of mankind. However, it seems that today both the US and the rest of the world pay no heed to the words of a man who spent 30 years of his life fighting international drug trafficking. The first US state to legalize the use of marijuana for recreational use was Colorado after the referendum of 2000. Today, marijuana is legal in a total of 29 out of 50 American states, and you can buy it in Washington, DC just as easily without facing any charges. It is expected that sooner or later marijuana will become legal all across the United States. The legal cannabis market is valued in billions of dollars and counting, with huge tax deductions flowing to the US treasury, as thousands of tourists come to visit America to get high legally. It’s reported that the state of Colorado received 82 million tourists back in 2016. The booming market with crazy incomes has had a strong intoxicating effect both on the US government and legislators in all parts of the world. A number of countries have already taken their first steps towards legalization of marijuana. Last July, the constitutional court of Georgia lifted the ban on the recreational consumption of marijuana, with Czech Republic closely following suit. At the beginning of October, Canada made its first steps in this direction, thus (beginning a national experiment that will alter the country’s social, cultural and economic fabric, and present the nation with its biggest public policy challenge in decades. For many, it was a seminal moment, akin to the ending of Prohibition in the United States in the 1930s. Under Canada’s new federal cannabis law, adults will be allowed to possess, carry and share with other adults up to 30 grams of dried cannabis. They will also be permitted a maximum of four homegrown marijuana plants per household in most provinces. Against the backdrop it’s hardly surprising that Canada’s Canopy Growth Corp. is planning to invest more than 100 million euros in the cultivation of medical cannabis across the European Union. According to BNN Bloomberg, the company will build two production facilities for growing hundreds of kilograms of cannabis, which will be “used in treatment”. It seems that people in the Ivory tower are all but convinced that the most promising and non yet fully-regulated markets for medical use of marijuana is Europe. Therefore, Canopy Growth Corp. has been busy finishing facilities in Italy, Greece and Spain. It has already secured a partnership with Alcaliber SA in Madrid, has almost opened the doors of a brand new factory in Denmark. According to its executives, German and the Great Britain are also regarded as a promising market. And while Germany hasn’t made up this mind on this issue yet, Britain is trying to keep up with other Western players in the legalization race. Last June, Britain’s former first secretary of state, William Hague proposed to legalize marijuana completely all across the EU. Back then he added that the use of marijuana shouldn’t be limited to medical purposes alone, raising the question of whether Britain should join the countries that legalized medical use of marijuana, or join Canada that has effectively created a legal, government-regulated cannabis market. Earlier, Britain’s Department of Health and Social Care would express its concern over the need to revise the laws that prohibit circulation of marijuana. However, Theresa May has made it clear that the revision can only concern individual cases of marijuana use for medical purposes, but will not alter the existing cannabis ban. The Home Office has also issued a statement saying that it has no intension of revising the classification of drugs. However, in spite of all of those statements, Britain allowed marijuana for medical use at the very beginning of November, . The ban on the use of marijuana for medical purposes was lifted for the first time in the history of the United Kingdom. Previously, marijuana would be regarded as a Class B drug, that prohibited individuals from possession of this substance. Repeated violators of this ban were risking a five years term. As some British opponents of marijuana use would point out, there’s credible scientific evidence that cannabis smokers show a decline in intelligence. Additionally, habitual use of marijuana is associated with an increase risk of psychosis, and may result in individuals turning to much more dangerous drugs. And it seems that we’re witnessing just that – a decline in intelligence in the UK that manifests itself in the behavior of certain representatives of the British political establishment. In particular, while speaking at the Policy Exchange think tank British foreign secretary, Jeremy Hunt confused Russia with China. In particular, Hunt stated that the West would like to find a way to return China into a ruled-based international order, only to make a correction moments later, pointing out that he was referring to Russia. However, it wasn’t long before Hunt turned to alleged danger to the Western democracies associated with China’s rapid economic development, as by 2030 it is going to become the largest economy in the world that will be, according to UK’s foreign secretary, an undemocratic one. Obviously, there’s a reason why the British tabloid would report on a major meltdown of the sitting British PM, who was allegedly yelling: “Come on then, fuckers!” at Brexit cabinet meeting, while being high. 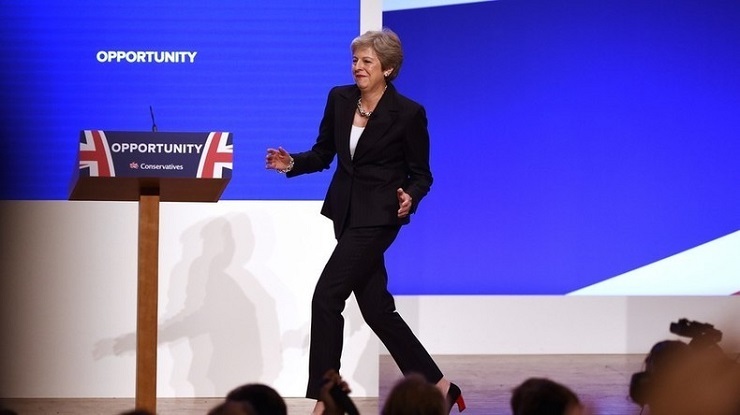 It is noteworthy that it’s the same media source that drew the public attention towards Theresa May’s awkward attempt at dancing in South Africa that was dubbed the ‘Brexit Shuffle’ for being unnecessary, haphazard and hugely embarrassing to the nation. One can only guess what is the reasons behind those strange outbreaks of deviant behavior and could this be in any way associated with London’s legalization of marijuana. However, when heroin smuggling from Afghanistan is concerned, it goes far beyond the realm of mere speculations, as it has recently been revealed by the UK Ministry of Defence that British servicemen were heavily engaged in these criminal activities. And surely one has to been under the effect of mind-altering substances to describe Russia’s animated series for kids called Masha and the Bear that can be found on YouTube as Kremlin propaganda (sic). Those writing such articles have a hard time understanding that animated series for kids in any state are designed to get minors exposed to such basic human values as friendship and kindness. In this respect, Masha and the Bear is no different from Walt Disney’s cartoons or the Harry Potter IP. So is there any particular reason why political elites across the UK have suddenly turned blur-minded, it seems that only time can tell. And, it seems that there will witness new outbreaks of Russophobic hysteria among British politicians, just like we’ve witnessed with the so-called Salisbury Incident that has left a rather shameful stain on the international reputation of the United Kingdom.